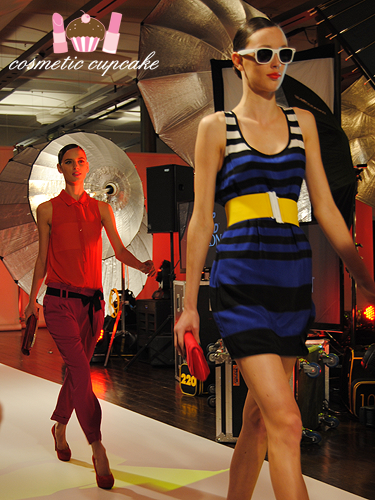 Last week I had the pleasure of attending the Top Speed by Revlon - Lights, Camera, Colour! fashion show for 30 Days of Fashion and Beauty 2011. I was invited along with other bloggers to sit in the front row which was super exciting!! The show was to showcase the gorgeous range of shades in the Top Speed collection that only take 60seconds to dry to go with the season's hottest trend colour blocking. 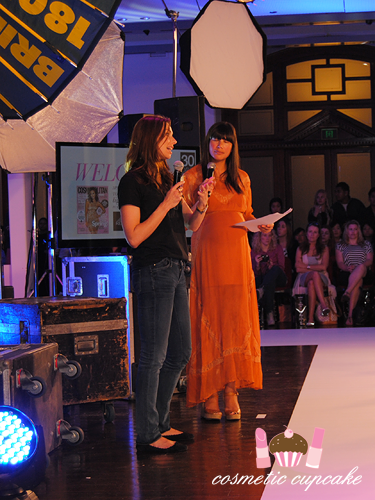 Show stylist Nicole Adolphe with make up artist Elsa Morgan describing the products used for the show and the trends. It's all about colour this season!! Outfits by Seduce and Dotti, jewellery by Pandora, shoes by Siren and Lipstick, bags by Olga Berg, makeup by REVLON and models from Chic Management. There are 32 gorgeous shades in the new Revlon Top Speed Quick Dry range and I'll be showing you swatches in the coming days. If you're in Sydney, you can get a super quick Revlon manicure using the new colours in the coming days! The Revlon Top Speed Glam Vans will appear in 4 popular Sydney locations and will be offering free mini manis - as well as giving away full size nail polishes to everyone who ‘checks in’ via Facebook! You can check out the event details here. Cost is FREE and make sure to turn up early to the Glam Vans and book your appointment. Appointments are approximately 20mins so get in early to avoid disappointment! Thanks for the heads up! The dress in the fourth photo is gorgeous! I wonder who it's by! @tiffyama: The show was awesome!! I'll be posting the swatches as soon as I can =) I wish I had more time for blogging doh! Wow - you got great shots, all the accessories! !